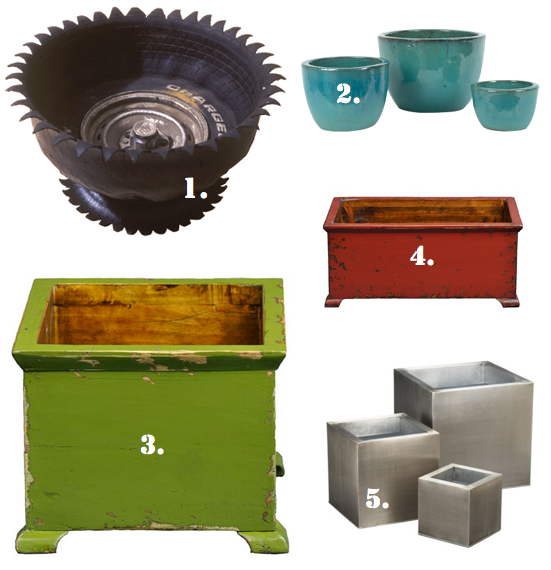 Friday’s Five Under $50: Planters! Time to start your seedlings! I don’t really like starting plants indoors for several reasons. One obvious one is that the more time I spend with the plant increases the chance that I will screw it up. The other is related to cats/kids/dirt. 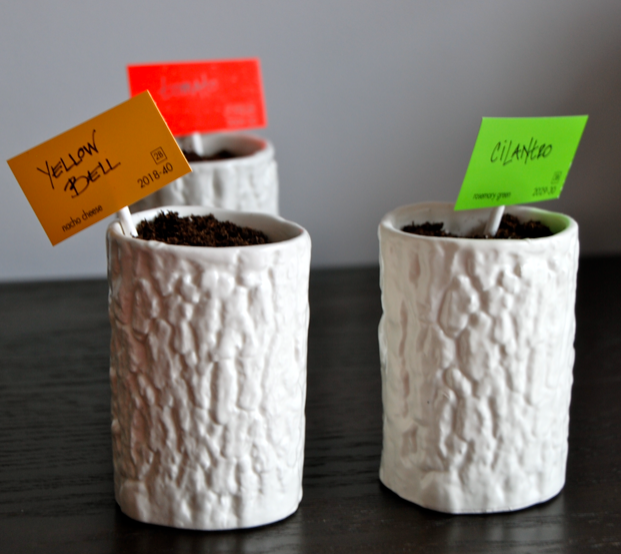 You can start them in peat pots or yogurt containers…or, if you’re like me and don’t really like the look of those things, you can start them in bud vases (just make sure there is a tiny drainage hole). This year, I’m growing tomatoes, yellow bell peppers, hot sweet peppers, arugula, and lots of herbs: parsley, chives, cilantro, italian sweet basil and dill. I’m iffy on “homegrown” cucumbers, so we’ll see. When your tiny green guys make the great trip outdoors, you’ll probably want to make sure they have pretty pots to keep them company. This is where the money-conscious gardener has a heart attack: gorgeous stone or ceramic pots can cost hundreds of dollars each. Never fear though, because here are five beautiful vessels that will suit beets, fennel, or mint equally well and make quite a presentation in your garden (or on your porch or balcony). So here is your Friday’s Five under $50! Now get planting! I love the idea of using paint chips to label your garden. I might do that with my potted herbs! Thanks! They’re actually pretty hearty and should stand up to water splashing for the few weeks they’re inside. If not, they’re pretty easily replaceable!